More than half the state of Texas is now gripped by the most extreme level of drought measured by climatologists and as I look out my window at the lush green strip of lawn in front of the office building across the street, I wonder how long they will be able to keep watering to maintain that look. A report released Thursday by national climate experts shows that Texas saw the highest levels of drought — rated as “exceptional” — jump from 43.97 percent of the state to 50.65 percent of the state. Folks living in these regions of the state are experiencing thousands of wildfires, dried up grazing land needed for cattle, and the loss of thousands of acres of wheat and other crops. 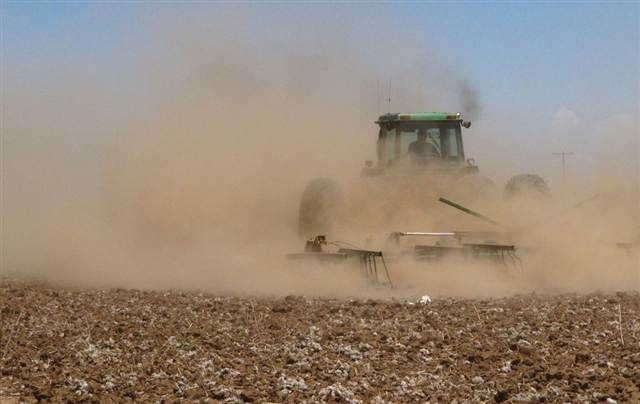 It has been estimated that Texas farmers and ranchers have already lost $1.5 billion in revenues this year, and officials say if the drought continues into June, losses will top $4 billion, making it the costliest season on record, impacting the entire nation since Texas is the nation’s second largest agriculture producer . Texas could be well on its way to breaking the record of 2006 as we contemplate this May’s estimated rainfall totals, which were only about 1-1/2 to 1-3/4 inches of rain across the state. This would make the March-May spring period the driest on record once the totals are confirmed. Texas has a long history with droughts, but it is still early and we will have to wait a bit to determine how this year ranks in the history of Texas droughts, but it is not looking good and so far the governor’s call for prayer for rain has yet to be answered. The persistent drought in the south comes even as too much rain has been falling to the north with flooding prompting wide-spread evacuations, and tornadoes spawning as disturbances move through from Dallas north and eastward, devastating communities in their wake. How much weather related devastation do we have to endure before our governments begin to seriously consider means to mitigate the effects of climate change?